X-Cart got started in 2000 and was founded by three students who have since then become experienced professionals. Since X-Cart has been in existence for a long time, it is well known, popular and has many customers. The product has been continually improved over the years and is now in use in more than 100 countries. 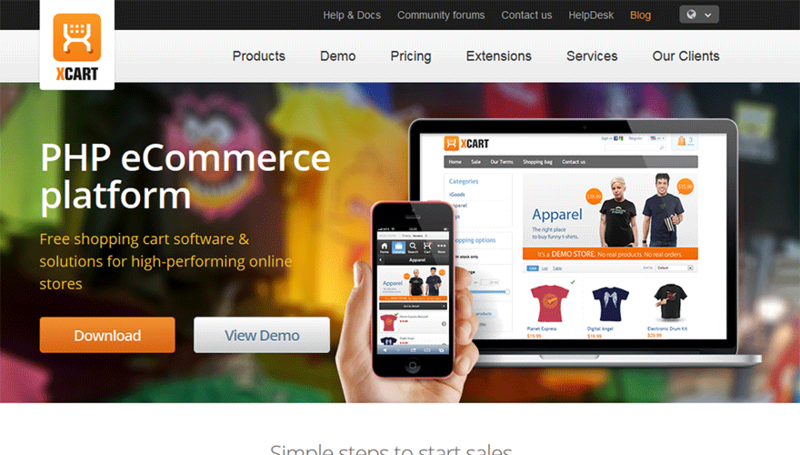 Thousands of stores are built on X-Cart’s eCommerce platform. X-Cart is popular for self-hosted enthusiasts that need multi-vendor support. For those that need this feature, you can’t beat the price if you are willing to host it on your own server. This is very expensive as a hosted solution with a lack of customer support options that other services provide at a cheaper rate. Setup is easy using a web-based installation wizard, and no programming knowledge is required to get X-Cart up and running on the web interface. There is a complete store-builder package, and you can import and export data in bulk for easy updating. Twelve templates are available for free and you can also customize the layouts using CSS. You may upload an unlimited number of products into an unlimited number of categories and display your items with as many images as you want. One-page checkout is optional; the site does not display product videos and does not seem to be mobile-ready, though multiple languages are supported. In terms of store administration, X-Cart is pretty comprehensive. You can upload products in bulk, and an optional backorder system is available to help you update your inventory information. Advanced inventory management makes it easier to manage the complexities of your store. You can sell downloadable or physical products through your online store. Performance reports and traffic statistics can assist you in analyzing your store’s sales so you can improve your bottom line. To market your products, you are given product coupons as well as a daily offers option, which is a relatively unique offering among eCommerce platforms, so that’s a great feature. The platform is search-engine friendly, and you can keep in touch with your customers easily with a built-in newsletter system. Social networking is available and direct social offers are optional. You can display customer reviews directly on your site. Live chat is not included, however, nor are retention tools nor a loyalty program. Up-selling and cross-selling are supported, and there is an affiliate system that can help you promote. You also can provide gift cards, and gift wrapping is an optional feature. X-Cart is a pretty expensive platform by any consideration. The pricing tiers are based on single payments with no recurring monthly or annual fees. The least expensive option is X-Cart Gold, which costs $159. The next option up is X-Cart Pro, for $491. The most expensive version of the software costs $1,189. The top two tiers are used by vendors who require the capability to enable multiple suppliers to sell through a single storefront. At the highest level, you get improved security standards. There is no delivery network feature for any of the tiers, however. X-Cart does not include technical support in its one-time payment price; you have to pay extra for support, so that tacks even more onto the price of the software. Customer support is not a strong area for X-Cart; there doesn’t seem to be any 24/7 availability, nor are we sure the support is provided by in-house representatives, and you do have to pay extra for it. You can reach agents via telephone or email, and there is also a live chat agent who assists with sales. There is a user manual and a knowledge base but we did not notice video tutorials on the site. A forum is provided for discussion with other users. This may be a better way to find answers to your questions, though of course you cannot always rely on other users to be able to help you, especially if you’re dealing with an error. A single payment service definitely has its appeal; over the long run, you can theoretically save money if you don’t have to pay in monthly installments to use your software license. While this makes sense, it’s also true that you’ll be paying monthly installments anyway if you want to receive technical support, and this is where any service which charges for support ends up costing just as much over the long run. X-Cart is substantially more expensive to begin with than many other eCommerce platforms, which don’t cost nearly as much up front. We would only give X-Cart a 5/10 for pricing since we’ve seen many superior deals elsewhere. This brings down our overall rating; while the features which are included are great, we also wouldn’t mind seeing a little more in terms of product display and security, especially at the less expensive levels. Administrative tools on the other hand are top notch and include pretty much everything you could ask for in an eCommerce platform. For many users, this will be the most important aspect of the software. Overall, TopFiveAdvisor gives X-Cart a 7/10. This is a professional service, but it’s at a premium.